Tomorrow (3/16/19) marks the 20 year anniversary of EverQuests official launch. And, the folks at DayBreak asked if I would do a comic to commemorate the event to which I said of course. I may not play EQ or MMOs anymore, but EverQuest is the heart and soul of the original comic. 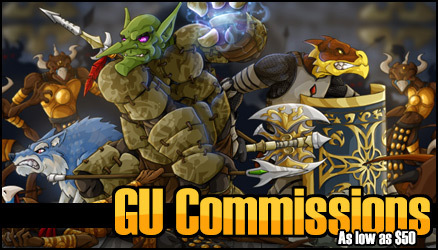 Without cyclops' sneaking up on you while you're medding, where would GU be right now? 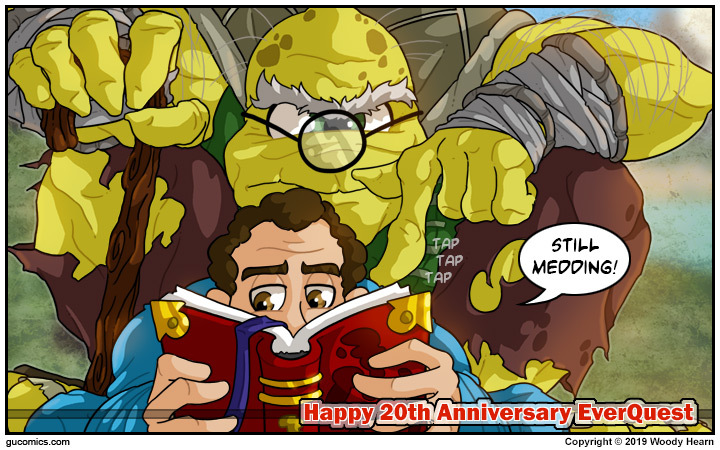 The original version of this comic can be found here: "Not Now I'm Medding!". After 20 years though Mr. Cyclops has just gotten a little older, a little greyer, but he's just as patient with his pending beat down. As part of the celebration DayBreak will be opening Gnome Memorial Mountain on March 16, 2019. This is a new, open world zone with new content in the form of 11 quests, 2 heroic adventures, 1 mission, 3 raids (for players 95+), 21 achievements, and 4 new collections. I didn't see any mention of a new Barbarian Warrior NPC in there named Vhah, but we can always hope, right?